Leonardo Da Vinci, the infamous renaissance artist not only made his mark in the big cities of Rome and Milan, but he also left precious treasures here in Lecco. I’ve set out to try to visit them, so one by one I will share them with you! 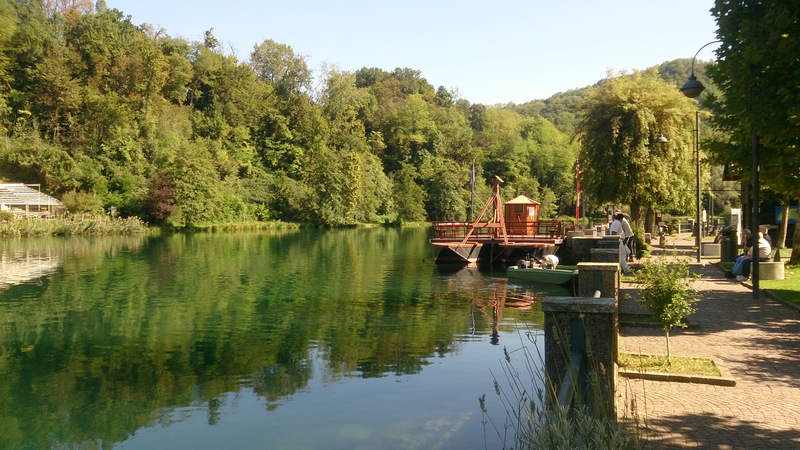 Leonardo da Vinci built a self propelling ferry which uses the river flow to move it across the river. The propellers are turned and it can cross again back to the other side. There were once five of these, but this is the only remaining working model. It is used daily to transport people as well as cars. I didn’t see it in action, no one was crossing that day. But I stopped and had an ice cream and enjoyed the nature! You can ride a bike all the way from Lecco center by following the bike path on the Pescate side of the Adda River (20km). Or drive to Brivio center (15km) and take a lovely 30 minute walk along the lake (5-7km). You can also drive directly to the launching dock at the corner of Via Adda and Via Donatori di Sangue, Imbersago.